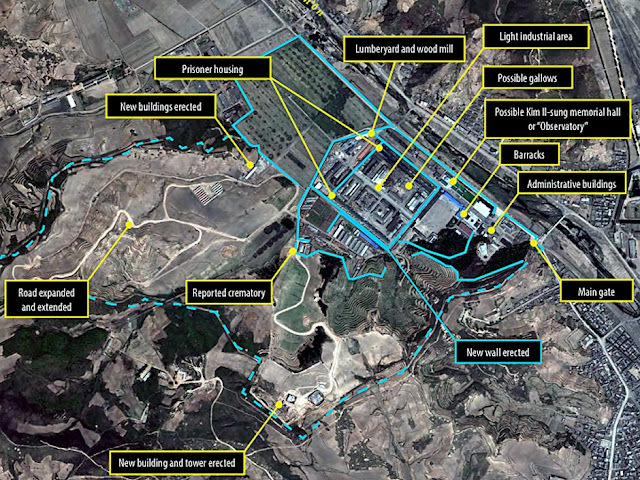 Camp 25 in the North-East of North Korea as seen from a satellite in May 2012. The facility has significantly increased in size since 2003 with a reported prisoner population of 5,000 and with presumed more set to arrive soon. Solid blue lines represent solid walls and dotted lines represent perimeter fences. In this morning’s Globe and Mail (Toronto), reporter Mark MacKinnon has an article on North Korean slave labour in Vladivostok, the site of the recent APEC (Asia-Pacific Economic Cooperation) meeting. North Korean workers are common in the Vladivostok construction industry, which according to MacKinnon underwent a $20 billion overhaul before the APEC meeting. MacKinnon interviewed a North Korean worker named Babai, who claims that his pay is much better than in North Korea itself, even though he himself never sees it, despite working 12-15 hour days. Instead, an official from the Korean Workers’ Party collects his pay and sends it back to the North Korean government. Meantime, Babai and other North Korean workers live in seemingly abandoned apartments and even in an abandoned underground bomb shelter. North Korea is so blatant about this slavery that it even advertises its workers on the Russian equivalent of Craigslist! There is little we can do about slavery inside North Korea. An estimated 150,000 to 200,000 people are imprisoned in concentration camps where they produce raw materials and industrial goods for export to earn hard currency, without pay and often on sub-starvation rations. The North Koreans believe in imprisoning three generations of any alleged criminal’s family, so many of these slave labourers are elderly or children. The amount of food they are given depends on how much they produce, so there’s a downward spiral leading to death by starvation: the less you produce, the less you eat, the less you eat, the less you produce, etc. until you die. These prisoners also produce luxury goods for the party élite and the military, and work in mines, quarries, and nuclear facilities. Obviously, they are not issued protective clothing, nor are they allowed days off or rest. Prisoners also perform hard labour by hand, repairing roads or pushing train cars, because North Korea doesn’t have enough functioning machinery. For more on North Korea, see my post on July 27, 2012 reviewing Blaine Harden’s book, Escape from Camp 14. But even if we can’t stop slavery within North Korea, we can stop North Korean state slavers from renting out slaves to other countries. Slavery has been illegal under international law since 1926, and slavery is a crime against humanity under the Rome Statute of the International Criminal Court. Yet the Russian government colludes with North Korea to import these workers. The Russian government and all others who “hire” North Koreans through their governments should stop this immediately. And the Russian government should advise local officials and private contractors that they must immediately cease renting these slaves from the North Koreans, or risk arrest. In the meantime, I wonder if any of the APEC participants will care enough, even in retrospect, to condemn the Russian officials who tolerate this slavery. Mark MacKinnon, “How Unpaid North Korean labour helped Russia welcome the world,” The Globe and Mail, (Toronto), September 11, 2012, pp. A1 and A19. Rhoda E. Howard-Hassmann, “State Enslavement in North Korea” submitted to Joel Quirk and Annie Bunting, eds. Slavery, Human Rights and Development (working title). Available on-line at https://www.wlu.ca/documents/50531/slavery_dr8_FINAL__march_16_2012.pdf or at Genocide Watch, http://genocidewatch.org/images/N.Korea_12_2_22_state_enslavement.pdf, or contact me at hassmann@wlu.ca for a copy.